Preparation - Store and use at room temperature (73°F/23°C). These products have a limited shelf life and should be used as soon as possible. Environmental humidity should be as low as possible. Good room size ventilation is essential. Wear safety glasses, long sleeves and rubber gloves to minimize contamination risk. Spraying should be done in a well-ventilated area. Apply A Sealer - If spraying plastic over a porous surface, (gypsum plasters, concrete, wood, stone, etc.) a sealer must be applied to facilitate release followed by applying a release agent. SuperSeal® (available from Smooth-On) is a fast drying sealer suitable for sealing porous surfaces without interfering with surface detail. Shellac is suitable for rough contours and modeling clays that contain sulfur or moisture (water based). NonPorous models made of metal, glass, acrylic, pvc, other hard plastics and sulfur-free clays require only a release agent which should be allowed to dry before applying the rubber. Applying A Release Agent - A release agent is necessary to facilitate demolding when spraying into or over most surfaces. 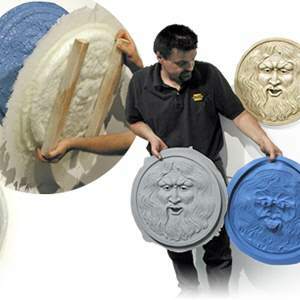 Use a release agent made specifically for mold making (Universal® Mold Release) available from Smooth-On or your Smooth-On distributor). A liberal coat of release agent should be applied onto all surfaces that will contact the plastic. Spraying - For best results, always spray in a waste bucket first to purge any solvent in the spray machine lines. Spray on a thin first coat, moving quickly. Spray undercuts and recesses first. Wait two minutes between first and second coats. Heat from the first coat will speed the cure of the others. Spray bottom edges with many thin coats to avoid drips and voids. Work from bottom to top. Increase the pressure for heavier coats and cut the tip to get a better spray pattern. Curing - EZ~Spray® Plastic will gel immediately and can be demolded in about three hour depending on mass, configuration and ambient temperature. Performance - Cured EZ~Spray® Plastic is semi-rigid and durable. Plastic resists moisture, moderate heat, solvents, dilute acids and can be machined, primed/painted or bonded to other surfaces (any release agent must be removed). If machining cured EZ~Spray® Plastic, wear dust mask or other apparatus to prevent inhalation of residual particles. Castings can be displayed outdoors after priming and painting. Unpainted castings will yellow when exposed to ultra-violet light.